Each material has different specifications for heat time, temperature, pressure, and peeling. Be sure to check the Technical Data Sheet for your product and make sure you are following all recommendations. TIP: If you peeled a cold peel too soon, just repress it for a few seconds and then try to peel again after the material has had time to cool down. Most of our products will work well with cotton, cotton/poly blends, and similar fabrics. If your garment is 100% Polyester (or close), try splashing it with some water. If it absorbs, you should be able to use most of our products. If it beads up and rolls off, you might want to try something like HotMark Revolution, which is specially formulated to adhere to resistant materials such as nylons. f you are using a suitable material for the composition of your fabric and you are using the correct temperature, time, pressure and peel temperature, it might be time to calibrate your heat press. You can contact the manufacturer of your heat press to find out how to calibrate the temperature and pressure. Be sure to perform a test cut. Most cutters cut a triangle inside of a square, or a square inside of a circle. You might have to consult your manual to determine the procedure for performing a test cut. The object is to be able to easily weed the outer shape, while the inner shape stays on the carrier. If the outer shape won’t weed, increase your force. If the blade has cut too deeply or entirely through the carrier, decrease the force. If the outer shape came up easily, the inner shape stayed down, and the liner was lightly scored, you are good to go. If you are still unable to get a clean cut, try changing your blade. If that does not help, it is probably time to change your blade protection strip or blade holder. Most cutters cut a triangle inside of a square, or a square inside of a circle. You might have to consult your manual to determine the procedure for performing a test cut. The object is to be able to easily weed the outer shape, while the inner shape stays on the carrier. If the outer shape won’t weed, increase your force. If the blade has cut too deeply or entirely through the carrier, decrease the force. If the outer shape came up easily, the inner shape stayed down, and the liner was lightly scored, you are good to go. If you have difficulty seeing your cut lines, try to reverse roll the material to make them more visible. If you find the adhesive on the liner too aggressive, try placing the design under a heated heat press for a few seconds then try again. This is likely due to pressing at too high a temperature or too high pressure. Always consult the technical data sheet for suggested temperatures and pressures. After washing, the color of the garment is coming through the HTV. This is normally caused by sublimation inks that were used to dye polyester garments. Sublimation inks can be reactivated with heat and then migrate on the heat transfer material. The solution is to use a product which contains a barrier to the migration of inks such as HotMark SIR, BestPrint SIR, or HotMarkPrint SIR. 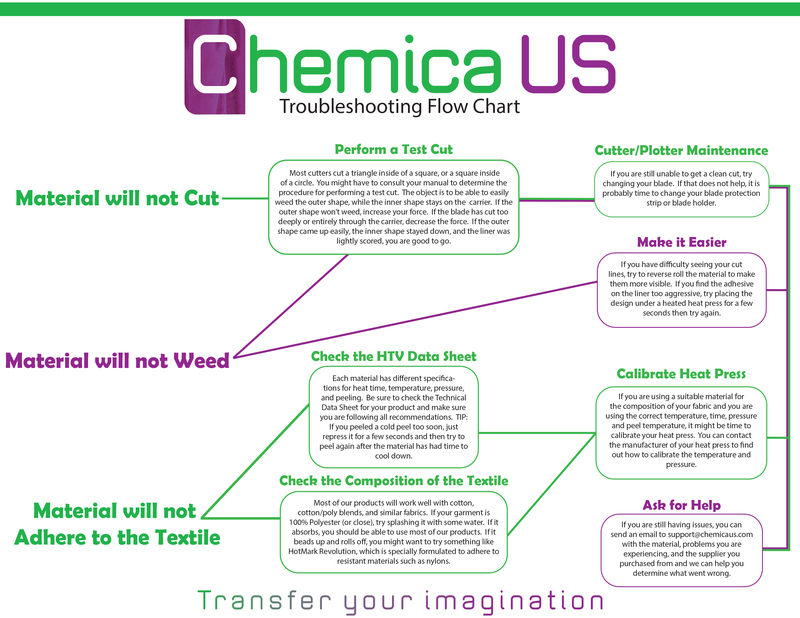 Here is a flow chart that outlines the most common problems that arise when working with HTV.